Orders – It’s the first step to make an ad campaign in DFP, this is important and necessary step to pass, the order needs to be approved at the end. 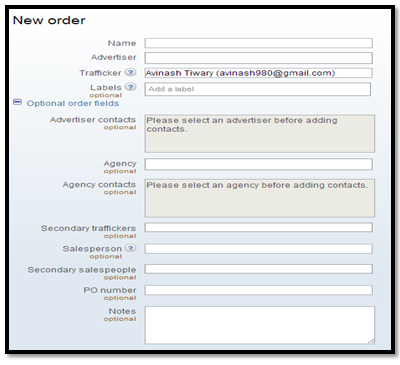 Provide an order name according to the advertiser for which you are making the campaign. Name it as per your best understanding, provide all the information about your advertiser, this is beneficial when there are number of campaigns and you need to contact specific campaign contact person, you can use the information provided here. NOTE: These information are OPTIONAL, except Name, Advertiser and Trafficker field. Create the company or advertiser name if it’s the first time we are running the campaign for them. Click on the text box in front of Advertiser, you will see screenshot as below, just select if your advertiser is there in the list or else click on Add a new company. Competitive exclusion: Categorize line items to prevent two line items in the same category from being shown at the same time on a webpage. For example, you could categorize line items as ‘auto’ and prevent two different car companies from showing ads together. Ad exclusion: Categorize line items so that you can prevent them from being delivered in emergency situations. For example, you can use ad exclusion labels to prevent airline ads from being displayed next to news articles about a plane crash. 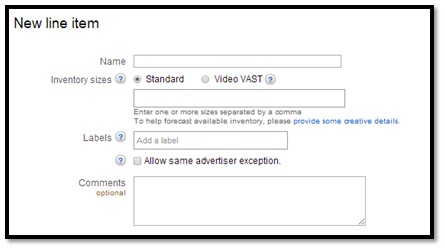 Ad exclusions also require that you make changes to your ad tags. Name: Line item naming should be in proper format and should be unique within the network. 2. 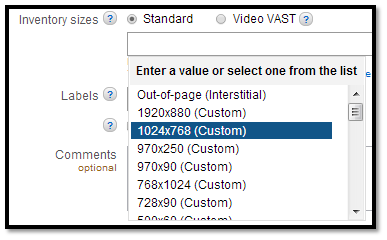 Video VAST – This option is selected when there is a video that has to run along with the companion ads, VAST is video ad serving template. Labels: Same as above, here it is not optional. Ad Exclusion: It prevents line items from being delivered to ad units whose DFP tags include a matching key value. Allow same advertiser exception: This option is selected when there is need to this line item and other line item of same advertiser to be able to appear on same page together, i.e. on the same page two different ad of same advertiser will appear, elsewise it won’t. Comments: Any information that you want to keep for this line item for your own use, you can add here. This is optional and can be ignored. Let’s jump up to the setting of the line item that is being setup. The settings are done as per the category type you select. Types of settings are: Seven types in total! Standard: This is the most general type that is selected and is selected for impressions or clicks based campaigns. The type serves fixed number of impressions or clicks. Also priority of the flight can be tuned while running too. Billing is CPM or CPC! Network: This type is typically used for Ad networks and works for unsold inventory. Billing is CPM or CPC and Default Priority is 12! Bulk: Bulk is another type used for fixed number of unsold impressions or clicks. Billing is CPM or CPC and Default Priority is 12! Price Priority: This type is used to fill site’s unsold inventory with the highest paying line item available. In this we can specify daily or lifetime delivery caps. It delivers as fast as possible by default. House: This is the lowest ranking line item used for promoting products and services. House ads are commonly non-revenue generating and always have the lowest delivery priority. This is served when no other ads are booked. Default priority is 16! 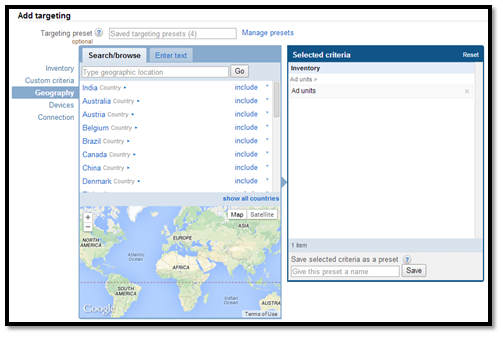 AdSense: This targets AdSense ads to inventory and audiences. It enters AdSense ads into competition with remnant DoubleClick for publisher ads. Default priority is 12! Quantity: This option is used for fixed/target impression or clicks, say if a campaign is running on CPC model and the target is 10,000 clicks, you need to keep the quantity as 10,000. Discount: It is the amount by which you plan to reduce a line item’s cost. This information is for reference only and won’t appear in reports or affect a line item’s priority based on rate or value CPM. Total Value: It is the total amount that will be charged. This field is automatic and will calculate as per the values provided in the above fields. Evenly: Delivers impressions equally over the course of the campaign. Example: If 10,000 impressions for 30 days, it will automatically divide the total impressions by 30 to deliver equally each day. As fast as possible: Delivers up to the impression goal as quickly as possible. It won’t look for the number of the days the campaign has to run; it may end up delivering all impressions in one day. Only one: Show only one creative per page. One or more (default): Allow multiple creatives associated with this line item to show together. As many as possible: Show creatives in as many ad units as possible on a page. The line item will only be delivered if one of its creatives is served to the first matching ad slot on a given webpage and can only be used for line items with multiple active creatives. All: The line item will only serve if all of its creatives can be delivered to the page at once. *Condition-Only compatible with line items targeted to Google Publisher Tags using single-request mode. Evenly: Creatives rotate evenly. Say, if 100 impressions and 4 creative, then 25 impressions will be given by each. Optimized: The creative with the highest click-through rate will be shown more often. This option is majorly used. Weighted: The delivery of creative is adjusted as pet the weightage you put on creative. The creative is maximum weight specified on creative tab will be delivered more than the creative whose weight is defined less. Sequential: Creatives rotate in the order you specify. You must enter a number between 1 and 80 for each creative. Day and Time: This option is used of defining any specific day or time when the creative should serve. It is also called as day and time parting. Frequency: It controls the number of times a visitor sees the same ad over a minute, hour, day, week, month, or lifetime. 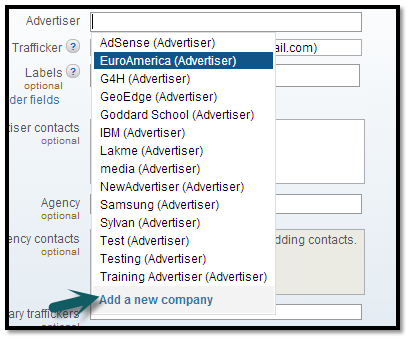 This step defines the targeting or the destination where the ad will run. It includes Geography, Devices, Inventory, Connections, custom like specific age. Targeting Present: Present is bunch of criteria or targets. If A, B and C together needs to be targeted for some general lines, it is the best approach to form a present giving a name and next time when you need to target A, B and C you don’t have to manually select each but just the present. It is an option to shorten your work and time. Please use the above targeting criteria as per the campaign requirement, if none is selected the campaign will run on RON and all locations, devices, connections, etc. This option is used for delivery forecasting with the selected criteria in the above fields. Clicking on check inventory shows the results to determine if the prospective line item will meet its impression or click goal, or if you need to make changes to it or contending line items. After all the above seven steps we need to proceed with the creative setup. Very helpful article for beginners. I’d like to add couple of points which might be helpful. 1. Once order is saved, we cannot change the Advertiser details. Apart from Advertiser details, everything can be changed. 2. One of the most important type of setting is Sponsorship. This has the highest priority when compared to other types of setting. This uses CPD as pricing model and is the highest price model. We set percentage goal for such line items. Thanks a lot for your two amazing points Rishabh. However, I have a question on this ad serving platform. We book the campaign in DFP and our publisher DSP platform which are synced at back end. Though the booking is done with correct impressions in DFP and publisher DSP platform we see difference in delivery of impressions. Could you please let me know why is that discrepancy? The difference in delivery is due to bidding value, it can be lower or higher completely depends upon the quality of inventory. To have a better understanding of your question, when you say discrepancy is it day to day you see the the difference in delivery? NOTE: Even if the delivery differs the final cost won’t differ. Can you explain NATIVE Ad trafficking in DFP ? i have a question, How do you check the amount of trafficking to buy for a website? This complete depends on the requirement and present traffic the site is generating. It also depends on the client interest, you can always check the analytics data to see the organic traffic and then evaluate on the part of budget. Hey, i would like to evenly rotate creatives from more than 1 advertisers. I had set type to sponsorship and goal to 100%, if i have 4 advertisers, i thought calculation should be each creative has 25% to display on website? If i understand well you are trying to create a placement having 4 creative from different advertiser that will surely have equal division i.e. 25% each. Do you have any information on Open Adstream and Adobe Target Premium? What kind of information do you need on the same? Open AdStream is Appnexus for publisher, you can relate with AdSense also. Adobe target premium is optimization tool helps in personalisation. HOW CAN I CREATE AN ACCOUNT FOR DFP, my website is http://www.daleplay.tv and I am broadcasting video content and would like to have interactive ad insertion. what do you recommend? Its a feasible info provided especially for DFP Beginners. I have a query regarding rotations,Could you please elaborate with Real time example for Optimized and Weighted rotations.